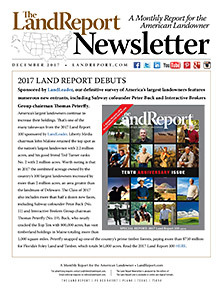 Enjoy the fascinating stories of America’s leading landowners as the Magazine of the American Landowner presents the 2017 Land Report 100 sponsored by LandLeader. With 2.2 million acres, Liberty Media chairman John Malone retains the top spot; his good friend Ted Turner ranks No. 2 with 2 million acres. New names added to our list this year include Peter Buck, the cofounder of Subway, and Thomas Peterffy, chairman of Interactive Brokers Group. Get the 2017 Land Report 100 HERE.